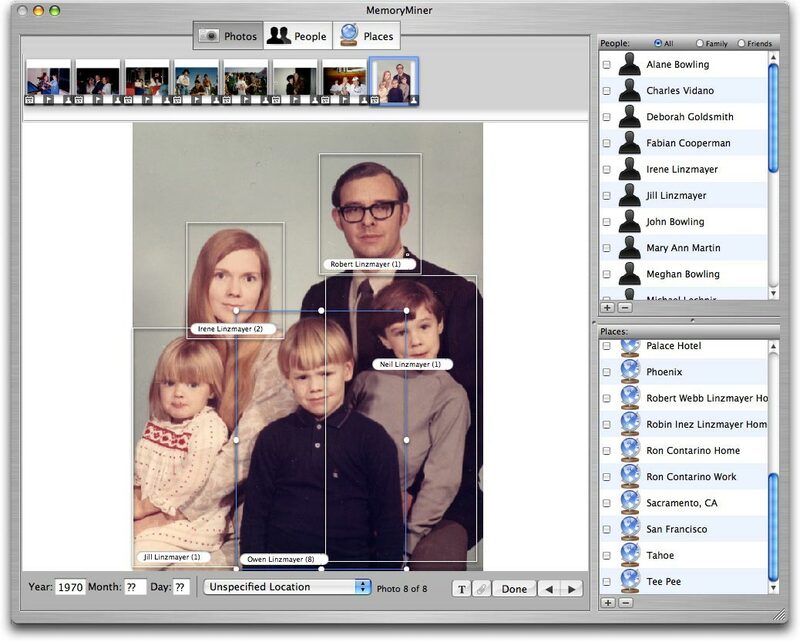 GroupSmarts’ MemoryMiner 1.04 is an innovative new program that enables you to categorize your photos by who’s in them and where and when they were taken, then lets you view those pictures in slideshow “stories” that follow the connections between people across time and space. Unfortunately, while the concept is cool, the program isn’t ready to deliver on that promise. MemoryMiner starts by automatically importing Address Book records of people who share your last name, so much of the information about your immediate family is available right away. You can also manually add as many people as you like, specifying name, gender, and birthday. Note, however, that even though you can specify relationships (father, brother-in-law, nephew, and so on), MemoryMiner is not a genealogy program and isn’t designed to create multimedia family trees. Also, the only way to access information from other PIMs or via vCards is to import it into Address Book first. The next step is to import your photos—which really means MemoryMiner creates a relational database of them, with links to the originals. You can import your entire iPhoto library, or manually add individual photos from any source, so long as they are in a format compatible with Preview. After importing photos, MemoryMiner lets you annotate your pictures, identifying people and places and specifying dates. The process is quite intuitive. Drag a person’s icon from the list at the right onto a photo in the main window and a selection rectangle appears that you can resize to encapsulate the entire person. Likewise, you can drag and drop from the list of locations to indicate where a photo was taken. After you’ve imported a photo into MemoryMiner, you can specify who’s in it and where it was taken by choosing from the panes on the right; you specify dates down below. MemoryMiner obtains longitude and latitude coordinates from the Web to plot your pictures on a world map, and can even show street-level detail if you specify a photo’s location with enough precision. MemoryMiner automatically looks up locations imported from Address Book, but if you have lots of locations that you entered yourself, you have to click Get Map for each location; the program then looks up each one online. That process soon becomes tedious, as you have to wait for each location to be processed before moving on to the next. You can also annotate each photo with text, and attach any type of file to it. MemoryMiner stores all this information in a single relational database; unfortunately, there’s no easy way to create separate databases or documents for different projects. Conceptually, I like MemoryMiner, but it’s closer to a beta release than a finished product. The program is missing many basic features, such as sorting and Undo. Some features work inconsistently: You can, for example, select multiple photos, but not multiple people. Data types have a fixed sort order; you can’t, for example, sort people by Last Name. MemoryMiner won’t display file names, iPhoto keywords, or metadata for the images in its database, all of which could help tremendously in annotating and identifying your photos if you’ve previously categorized them. While MemoryMiner integrates with Apple’s bundled applications, that integration is also inconsistent. For example, if you add a new person in MemoryMiner by dragging a selection rectangle over a photo, you have the option of simultaneously creating a new Address Book card. But if you add a new person by clicking the Plus Sign icon below the list of People, there’s no such option. Furthermore, dates, locations, keywords, and annotations you add to photographs aren’t synchronized with their iPhoto originals. Furthermore, the program suffers from many glitches. For example, when dragging a single photo to the desktop, often two are dropped. Thumbnails are sometimes left blank after importing photos. Name tags don’t always reposition themselves properly. Choosing photos based upon who is in them doesn’t always work properly. Sometimes it’s impossible to return to the Contact Sheet view when you’re done annotating a photo. I could go on. Perhaps most disappointing of all, however, is that, for now, you can’t do much with your linked photos. Sure, you can view slideshows and use the program’s search tools to explore connections between people and places over time. But you can’t save the slideshows or burn them to disc. There’s an XML export capability that’s intended to allow you to share assets over a network or the Web, but there is only one ready-made Flash “skin” for doing so now, and I was never able to get it to work properly. In short, MemoryMiner 1.04 is a cool program with lots of potential, but this initial release isn’t ready for prime time. Fortunately you can check out the 15-day trial version before shelling out the $60 purchase price.